Beate Grimsrud reading from "En dåre fri"
A friend and I went to yesterday’s International Author’s Stage to experience Beate Grimsrud, the Norwegian, now Swedish-based, author of works like “En dåre fri” (roughly translated to ‘A fool free’) and “At smyge forbi en økse” (again roughly ‘To edge past an axe’). As far as the Scandinavian literary scene is concerned Grimsrud has been very much talked about – she is one of the, lately many, author’s who have been highlighted for their use of autobiographical material to a level of extremely concreteness. She has been awarded several prizes for her authorship and recently she was nominated by Norway AND Sweden for the Nordic Council Literature Prize of 2011. Something she noted at the event yesterday was not the advantage some would claim. But, nonetheless, impressive. And in Sweden her style has even become a term in its own: Grimsrudsk (Grimsrudian) – narrative with detours, sudden associations to other subjects etc. 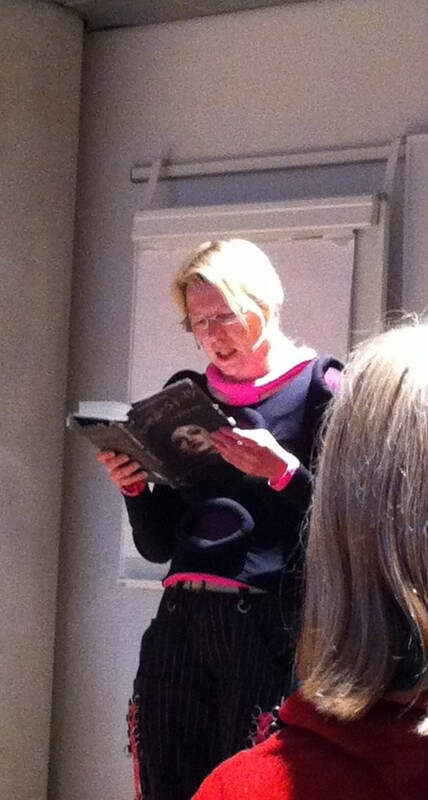 She started by reciting from “At smyge forbi en økse”, which, I’ll admit, was muy impressivo. Either she has done this a lot or her works sit so embedded in her she can just pick pieces to recount in front of an audience. Even though Anette Dina Sørensen (the interviewer) did most of the talking (she whipped up quite an analysis of Grimsrud’s authorship, kudos, both relating to queer theory, psychiatry, and autobiographical matter) what Grimsrud had to say was very much to the point. Her project is to open up or break down the barriers and categories we are so quick to set up and upholding – leaving us constrained versions of humanity. Men, women, mentally fit or sick, child, adult. When she read from “En dåre fri” people in the audience were nodding, laughing, sighing and acknowledging the narrative vivaciously – the experience was fascinating. When she read from her works the atmosphere in the room was like the audience became part of a single entity whose shared reciprocity enlivened the story Grimsrud told. Much in the spirit of what she argued about books: that they don’t really exist before they have an audience/readership. She told Sørensen how writing for her was like a sprinter at a marathon – she poured all into a book, writing with fervor and when she thought she had given all she could she realized that she had 40 km left to run! OK, she said it much better, with the calm air of a writer, or maybe you should have been there to hear it. Then they talked about the character of Eli, how Grimsrud used the ambiguous name so it would relate to men and women, and Eli’s schizophrenia that resulted in hearing voices, 4 male voices to be specific. One little tidbit: did you know that “En dåre fri” in Norwegian is not the same as its Swedish counterpart? And that the Danish translator has meshed these two into the Danish translation? This is fascinating to me. I have yet to read one of Grimsrud’s works, but I have a feeling that won’t take long – my fingers are already itching to use non-existing moneys on “En dåre fri”. We’ll see how long the struggle will be. Have you read anything of Grimsrud? I would love to hear what you think about her books, authorship, themes.